ORLANDO, Fla. - August 30, 2016 - FlightScope, a world leader in the development and manufacturing of launch monitors and radars for golf, today announces its partnership with U.S. Golf Combines, an organization providing student athletes with tools to stand out during the college recruitment process. As a result of the partnership, FlightScope's Xi Tour units were used by junior golfers at College Golf Day Combine events for instructional use to comprehend their game and compile data for recruitment. In addition, the companies are working together to create a custom skills challenge for junior golfers, using FlightScope as an assessment component. "U.S. Golf Combines was created to help junior golfers navigate the competitive world of college recruiting and our technology is the perfect tool to help players reach the level they want to achieve," said Henri Johnson, CEO of FlightScope. "Through this partnership, U.S. Golf Combines is helping junior golfers analyze complex data and obtain accurate information to present to coaches, agents, family and friends." U.S. Golf Combines has evaluated thousands of golfers over the past eight years and provides information about the traits of each player, filling the void around the lack of transparency in the average golf recruiting experience. With the addition of FlightScope's technology, players now also have access to in-depth swing analysis data. 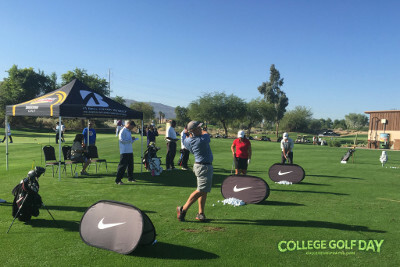 So far, hundreds of golfers have received scholarships after having their games tested by the combine Skills Challenge and evaluated by college golf coaches. "FlightScope's launch monitors offer our junior golfers the most accurate tracking technology and reporting available, giving players the best chance to be recruited by their top choice schools," says Andy Walker, co-founder of U.S. Golf Combines. "We created College Golf Day for talented junior golfers to showcase their skills and take control of their future, and our partnership with FlightScope continues to make these events successful." U.S. Golf Combines was created by Andy Walker and Darren Horrell to help junior golfers navigate the competitive world of college recruiting. Andy and Darren set out to create a scientific way to evaluate every aspect of a player's game, and generate a comprehensive report about a player's strong and week points, as well as their potential for success at the college level and beyond. College Golf Day was developed to give junior golfers a comprehensive report and resume building tools for the future. USGC College Day skill assessments are held throughout the country. To learn more about U.S. Golf Combines and events, please visit their contact page.